The adventures of the Dada Detective and his talkative mime client continue in this, the final(?) printed volume of a webcomic that ended before its time. As the volume opens, our duo reveal a crucial clue and head off to meet more silly characters, such as an eskimo who hates the cold, a woman for whom Morticia Adams was "her Martha Stewart," and yet another familiar character actor from the golden age of Hollywood. As with the first volume, the jokes are plentiful (such as a man trying to politely ask to use the restroom at a party, with hilarious results as no one gets what he means), and the references to my all time favorite movie pretty much hooked me on the story, which ends on quite the climax. Unfortunately, even with reading the remaining online comics, this is one story, that like Dada itself, came to an unfortunate and incomplete ending. Artist Freese moved on to other things (I can't quite tell what, as no online search reveals anything recent) and the webcomic is still dead as of this writing, though the site itself is still up. It's a shame that the writers did not continue the plot, because it was all so complex and rediculous that I can only imagine the grand absurity that would have tied it all together. My guess is they'd have probably Bogarted it from someone else's story, though--it would have been the appropriate way to go. I doubt if you can find the books anywhere, but Likely Stories is where you can find the archives, and it's definitely worth a look to see what might have been. 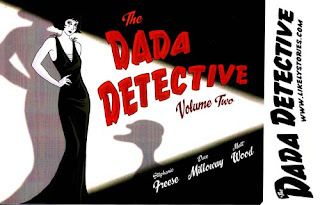 If you like funny detective stories, bad puns, and b-list celebrity cameos, you'll get a kick out of Dada Detective. Now if you'll excuse me, I need to toast a glass of bleach in memory of a fine story that I'll never know the end to. Maybe next time, I'll skip the bleach.